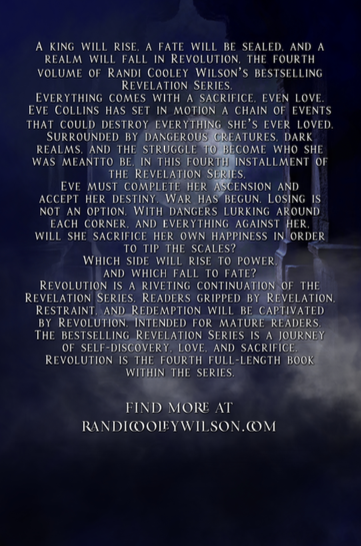 A king will rise, a fate will be sealed, and a realm will fall in Revolution, the fourth volume of Randi Cooley Wilson’s bestselling The Revelation Series. Everything comes with a sacrifice, even love. Eve Collins has set in motion a chain of events that could destroy everything she’s ever loved. Surrounded by dangerous creatures, dark realms, and the struggle to become who she was meant to be In this fourth installment of The Revelation Series, Eve must complete her ascension and accept her destiny. War has begun. Losing is not an option. With dangers lurking around each corner, and everything against her, will she sacrifice her own happiness in order to tip the scale of balance? Which side will rise to power, and which fall to fate? Eve must risk everything she loves in order to prevent a centuries-old war. Revolution is a riveting continuation of The Revelation Series. A journey of self-discovery, love, and sacrifice. Readers gripped by Revelation, Restraint, and Redemption will be captivated by Revolution. Intended for mature readers. The bestselling Revelation Series is a journey of self-discovery, love, and sacrifice. 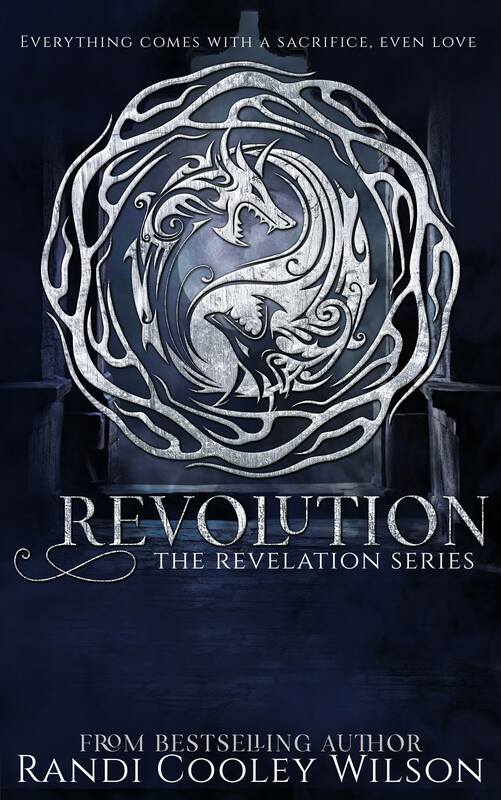 Revolution is the fourth full-length book within the series, which is meant to be read in release order. Once again, Randi Cooley Wilson paints a colorful world populated by equally colorful characters. There is so much that goes on in this book - betrayal, treachery, love, sacrifice - it's all here. GET THIS BOOK! GET THIS SERIES! Lose yourself into the world of some seriously hot gargoyles. I promise you, you won't regret it. Randi Cooley Wilson did it again! She left me on the brink, waiting for the next installment. Seriously, I need Restoration. NOW! The book was fast paced, full of twists and turns, and I couldn’t put it down once I started. It was worth the wait! I devoured this book in one sitting! I don't think there was one second where I wasn't desperately gripping the edges of the nook waiting to find out what happened next. You need to go pick this book up right now!! And if you have never heard of this series until now, then you better run to the store and grab Revelation right away! This is one amazing series that you don't want to miss out on, so make sure you check it out! Revolution is fast paced, incredibly original and full of fantastic people. The storytelling and dialogue play out like a Hollywood blockbuster with fight scenes, special effects and stellar romance. This is a series NOT TO BE missed! !